The Diller Teen Fellows is a pluralistic, international, Jewish leadership program. Over the course of 15 months Fellows learn about themselves and the world around them through the four pillars of Diller: Tikun Olam, Leadership, Jewish Identity, and Israel. 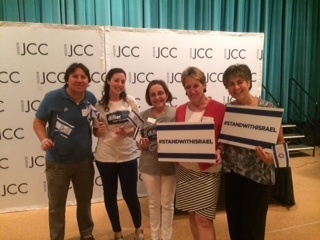 A huge part of the program revolves around a seminar in Israel where the Boston Cohort joins 19 other contingents to deepen their connections with and learn about the country. Unfortunately, due to the hostilities in the region, this years’ trip was postponed until the Winter. Israel has been under attack from Hamas, a Palestinian terrorist organization that governs Gaza. Israeli civilians and soldiers alike have been constantly bombarded with rockets fired from Gazan territory. Thankfully, the Iron Dome (missile defense system) has been extremely successful, intercepting around 95% of the rockets. Not only has Hamas been firing rockets, it has built an array of tunnels infiltrating the border allowing the possibility of an invasion. The Israel Defense Forces (IDF) have been fighting back to reduce these dangerous threats and protect the people of Israel. Although we, the Diller Teen Fellows, do not always agree with every decision the Israel Government and IDF might make, we do agree that Israel has the absolute right, and in fact the obligation, to defend itself. We fully support Operation Protective Edge to end the violence perpetrated by Hamas and bring peace to both Israelis and Palestinians. To compensate for our postponed trip and demonstrate our solidarity with Israel, our cohort decided to host an active, teen-specific gathering called #BostonTeensStandWithIsrael. We wanted to raise awareness in addition to making an impact, so we hosted stations where participants could take action. 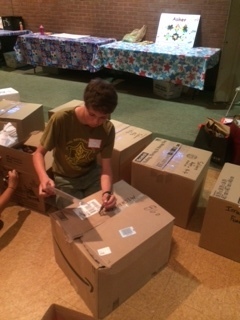 Care Packages for Israeli Children and Soldiers: A drive to collect items for children in the affected regions along with soldiers in the field, and packaged boxes to distribute through our Israeli counterparts. 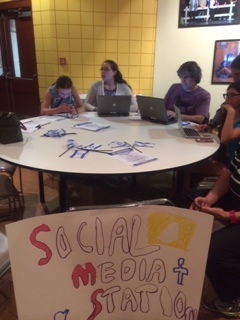 Social Media: Individuals learned how to advocate for Israel and voice their opinions via social media. For example, Participants could log into their Facebook and choose an article (that they agreed with) to post. 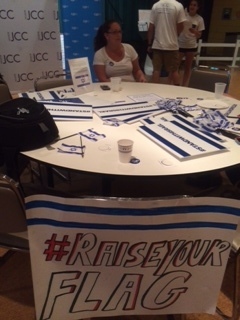 #RaiseYourFlag Campaign: Participants could take pictures of themselves holding posters and signs that were supportive toward Israel. These pictures were sent to Israelis and posted on social media. Video Messages for Soldiers: Individuals (or groups) could record a video message to send to soldiers articulating support or just a little more attention. 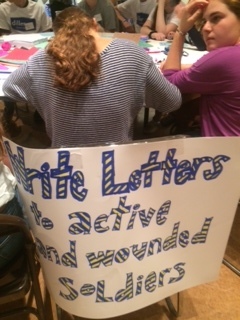 Homemade Cards for Children and Soldiers/Artists4Israel: Participants could draw pictures to place in bomb shelters and write letters to both children and soldiers. In addition to our stations, we had guest speaker, Perry Newman, the director of Israel Advocacy from CJP. He spoke about the current conflict and how important it is that we, as teens, advocate for Israel. Dani Weinstein, the director of Young Adults at CJP, joined Mr. Newman and helped us plan the event. We were joined by special guests Ariel Libhaber,. Ruth Kaplan, and Jill Smilow from the Living Bridges Committee through the Boston-Haifa Connection. In attendance also were members of the Board of the JCC and supporters of the Diller program. The event was vibrant and successful. We had significantly more participants than expected and sent over 16 large care packages. We achieved our goals of raising awareness and taking action. 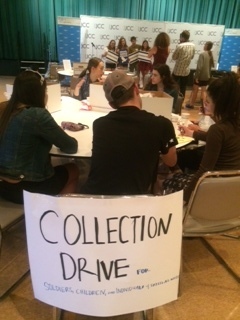 We felt good to be able to contribute with this event and provide an outlet for other teens to also help make a difference. 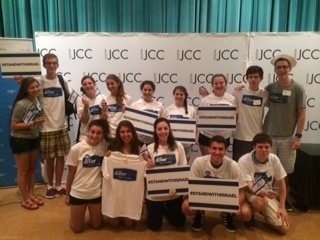 #BostonTeensStandWithIsrael! For the original Blog, pictures and videos, please click here.